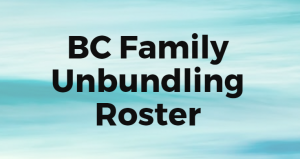 New on the Clicklaw HelpMap is the BC Family Law Unbundling Roster, filled with legal professionals across BC, who offer “unbundled” services. This listing is managed directly by Roster Staff. To see full profiles for professionals on the list, which contains information about fee structure, supported languages and more, visit the Roster website here. In short, unbundled legal services means clients pay for some assistance depending on: (1) what they want help with and (2) what they can afford. Most people would like to have the advice and assistance of a family lawyer, but hiring a lawyer to represent them from beginning to end is often too expensive and makes it difficult to predict total costs. Unlike the traditional full-representation model, a lawyer providing unbundled legal services works on, and charges you for, only those tasks that you agree to in advance. You start by meeting your lawyer and, as a team, make a plan to address your legal problem. The entire matter is broken down into tasks and you choose which tasks you want help with and which ones you will handle on your own. This approach is flexible, and can be adapted to meet your needs including your budget and your comfort level with managing your own legal affairs. Unbundling is not for everyone. The Roster website has a questionnaire that will help you decide whether it is for you. What are some examples of Unbundled Services? For example, if you are representing yourself in court you may want a lawyer’s help with drafting a document or pre-trial advice. If you are resolving your dispute through an out-of-court process like mediation, an unbundled lawyer can provide legal advice before mediation or draft a binding agreement after mediation. Common Question: What if I want legal help for only part of my (family law) problem? Common Question: How can I get the best out of my lawyer? Do you know a lawyer or paralegal who is interested in joining? Send them to this page on the Courthouse Libraries BC website, which offers a Sign Up link to join the BC Family Unbundling Roster, and a toolkit to assist and guide in the provision of unbundled family legal services in a safe and effective way. These core documents have been prepared with the assistance of the Law Society of BC.